Deadspin is a blog for the sports fan who loves the game but realizes that there's plenty of action happening off the field. Averaging more than 10 million page views per month, Deadspin is the web's most popular sports blog, a reliably snarky sports reporter that pretty much ignores the score of last night's game and focuses instead on the controversies and scandals that cling to modern sports heroes like Saran Wrap. Deadspin even breaks the occasional sports story;  it was first to report that Mark McGwire's brother is shopping a book that claims the baseball slugger first started taking steroids in 1994. 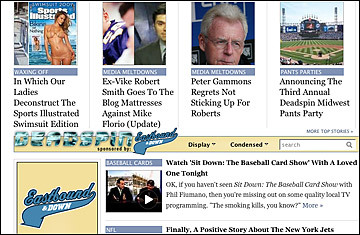 Deadspin calls out not only sports stars, but also those who revere them, in particular TV announcers. The blog's "Media Approval Ratings" feature invites readers to sound off on various sports media personalities, an exercise which often turns into an online public flogging. Sample Deadspin post: Even though we've been accused of having some sort of vendetta against Chris Berman in the past, we can honestly say that's not even close to true. We still (mostly) enjoy him on "NFL Primetime," or the "Blitz," or whatever the hell they call that now. Entry you'll never see: The Phillies topped the Mets last night 4-0, paced by a two-hitter from ace southpaw Cole Hamels.